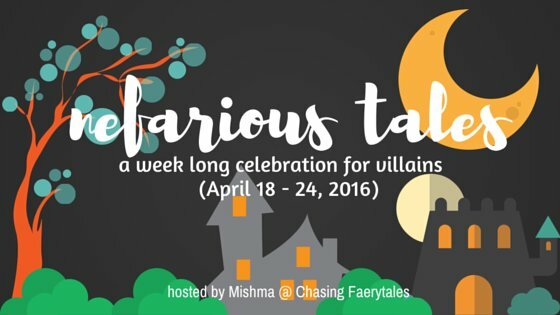 Mishma over at Chasing Faerytales has put together a blog tour about…villains! My prompt for this tour is about morally gray villains. No one person is completely “evil”, and no one person is completely “good.” Most novels and films forget this basic piece of human nature and tend to characterize villains as being completely bad, something that simply isn’t realistic. Who are your favorite morally gray villains? Interesting topic Zoe! I really agree with Luke, he wasn’t exactly evil, he just had his challenges. I would also put Draco from HP in this category, because he had his faults. Thanks Emily! I pity Luke – he was brainwashed by Kronos, but he was strong enough to realize his wrongs and make things right in the end. Draco as well. I completely agree Shar, and that’s why these antiheroes end up being so amazing and complex. I love the villains that have a redeeming quality. The ones that you almost love to hate and sometimes even just end up loving. I am a much bigger fan of morally gray characters than all bad villains. I rarely sympathize with villains whatsoever, and when they’re just BAD PEOPLE… I can’t even. Luke was the first villain I actually appreciated, because I felt like his back story made his character more lovable. I hope to find more and more of these characters on YA! I completely agree Lais. When villains are bad just for the sake of being bad, they don’t feel as complex and realistic as villains that are morally gray. And I agree about Luke – he was brainwashed by Kronos, but he was strong enough to realize his wrongs and make things right in the end. Oh, I love complex ambiguous villains! My choice is Ignifex from Cruel Beauty by Rosamund Hodge. This sarcastic and smart Gentle Lord is so deliciously complex and multidimensional. I read Cruel Beauty forever ago, but I do remember appreciating how complex Ignifex’s character was. 🙂 Definitely going to have to reread that one soon. Ooh Snape is a good one! I was definitely thinking Queen Levana too. I haven’t read any of the others, I have to admit. I do like morally gray villains better than straight up villains too. Makes them more scary SOMETIMES because you can see the human in them. Thank you Lauren! When villains are bad just for the sake of being bad, they don’t feel as complex and realistic as villains that are morally gray. I definitely enjoy morally gray villains more – it’s exciting to see if they can be redeemed – so happy that my boy Snape was. LOL Loved this post! And this topic! I love it to bits. Morally grey villains are some of my favorites–in fact, I see a few of my favorites on your list! I'm hopelessly obsessed with Snape and Victor in particular. Oh, but I'm also going to throw Peter Pan (from Wendy Darling by Colleen Oakes) up there as well as one of my favorites. He's mega dark and evil, but–I mean, can you really fault a child for becoming a murderous lunatic after having been cast away, unwanted, and forced to create a safe haven for other children like himself on an uncharted land? Of course he's going to be a little screwy. Oh, but I love him. This is such an interesting topic. I love morally gray villains. I would definitely put Draco Malfoy in this category. I feel like it would be interesting to have a story from his perspective. He was always one of my favorite characters (and my first fictional crush). There’s always that sense of what if he hadn’t been born a Malfoy and felt the pressures of his family…how would he have turned out? What decisions would he have made? Draco Malfoy is a great example of a morally gray villian. And I agree – it would be interesting to see his side of the story. SNAPE! Levana is a good one, though not my favorite. Probably that would be the Darkling from the Shadow & Bone Series. I adore him. Hahahahah morally gray villains are great to read about. I don’t think anyone would have sympathized with Levana if Fairest didn’t come out! Fairest was absolutely amazing. I don’t condone Levana’s actions, but I do understand why she turned out the way she did. Eeep, I love morally grey villains! IS IT BAD THAT I ALMOST ALWAYS ROOT FOR THEM?!? #SorryNotSorry I think it’s interesting how you said “most films and books” don’t use morally grey villains because I would’ve said opposite! I can’t even remember the last time I read a book with a very black-and-white villain…which is awesome. ;D I’m really impressed with how complex villains usually are. YAYYYY LUKE! I refuse to believe he’s evil. Fantastic post! I love anti-heroes and morally ambiguous characters too – they’re just so much more thought provoking. Queen Levana especially tore me in two directions because she was so bad and I loved the Cinder so much, but what happened to her was truly awful and I felt so bad. That doesn’t excuse her tyranny though, but at least it provides a reason for why she turned out like that. But my all time favourite grey character is Viserys from A Song of Ice and Fire. Great post! My thoughts exactly! I don’t condone her actions, but do understand why she turned out the way she did. Thank you! I love a good morally grey villian, they’re so interesting. 😀 Snape, what a good choice! They’re awesome, right? Thank you! I think this is why I still struggle to understand the villains. They are almost always just meanies I can’t understand. Even Queen Levana’s story didn’t really make me feel for her :/ She was just looney. Draco s story is a great example of a ‘gray’ villain to me! I completely see where you’re coming from Alyssa. Even despite their backstories, it can be hard to sympathize for villains. Thanks for stopping by! I absolutely love Luke Castellan! Although he slightly irritated me for his cruelty in the PJO series, I actually still kinda liked him. (And he was actually kinda good-looking in the Lightning Thief adaptation, so I can’t blame him.) 🙂 Great post Zoe! Luke is the best! He’s so bitter and hurt, and even though he does some terrible things, it’s easy to see where he’s coming from. Thank you! Morally grey villains are the absolute best! I love the complexity of their characters, and the balance between good and evil which exists in them! Wonderful picks as well, I have read all of your picks except Adelina – I really need to read Young Elites soon – and everyone of them are deliciously complicated! Yesss I totally agree with you on this! All bad villains seem so… cliche. And not very believable, and definitely not a character you can connect to. I like when there’s a bit of “well, maybe X isn’t SO bad….” only for the character to do something awful and having you rethink ALL the things again! Love this post! Thank you Shannon! 🙂 So glad you like them too! That feeling when I only recognise ONE out of your five morally gray villains. *sob* I NEED TO JOIN MORE FANDOMS.  BAHAHA THIS MADE MY DAY! And I’m going to take a wild guess and say that the one you recognized was Professor Snape? This is a really interesting topic Zoe! It’s true that sometimes, villains feel one-dimensional, but it’s so much more complex than that. I think that Luke Castellan in PJO is a perfect example of that, because truly, I wasn’t expecting him to be a ‘villain’ at first, and in the end, we can wonder if he really was one? This type of character development makes the reader wonder who he is rooting for, and who is actually the villain/the hero. This topic is so well adressed in Vicious! Moreover, I like how the boundary between villain and antihero is slim, like with Adelina in the Young Elites or Kaz from Six of Crows, but oh how I love these characters! Overall, I really like a villain with a compelling backstory, which makes me wonder if he’s even one. This is really interesting. I agree with Luke, he isn’t evil, he’s just bitter and hurt. I’m not saying his actions is right, but the Olympians had treated the demigods unfairly, like you can’t have kids and just leave them lying around as food for monsters or not claiming them. I also found The Darkling really similar with Luke. He just wanted justice for the Grisha. The humans had hunted, burned and killed the Grisha for so long, it’s perfectly reasonable that the Darkling want to protect his kind. His ways are wrong though. Lovely post Zoe! Adelina and Snape are the best morally ambiguous characters!! Some of my favourites! I definitely prefer the morally grey villains over simple ones. I think that’s part of why I’ve enjoyed reading the Game of Thrones novels so much more than I enjoyed the TV show–I feel like the books spend a lot more time digging into the characters and you really see how the “good” and “bad” characters aren’t always black and white. I think especially I liked The Hound, even though he was supposed to be the bodyguard for Joffrey and he was so so evil–but I think The Hound showed a glimmer of kindness and pity for Sansa when no one else did, and it made me think of him less as a one-sided monster and more as a man with complex emotions and motives. Those are the best kinds of characters to read about, they’re so much more compelling! Oh my God, Luke. He was definitely a villain, but he had a decent motive. I really didn’t see him being the bad guy coming when I read the first PJO book. Did you? I DIDN’T SEE IT COMING EITHER. But you’re so right – even if you don’t agree with the things he did, you can’t deny he had a good motive. I love that you have included Victor from Vicious!